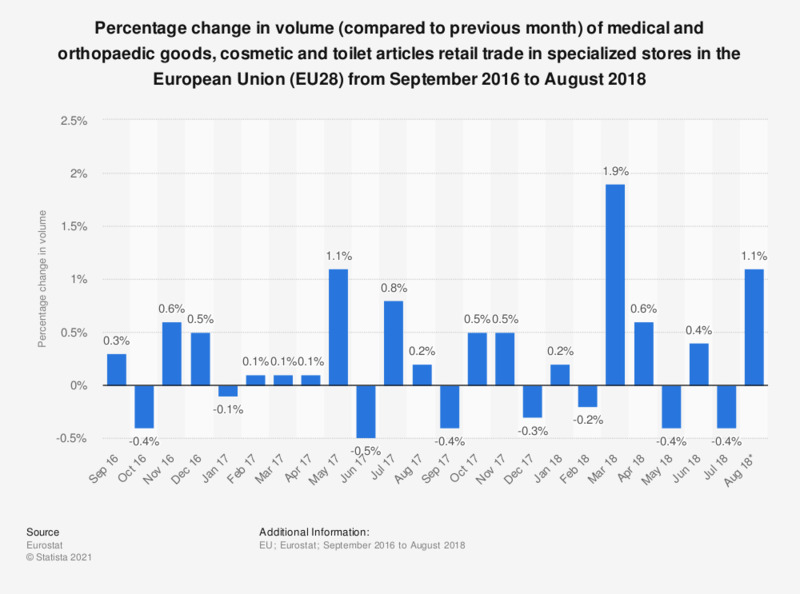 This statistic shows the percentage change in volume of medical and orthopaedic goods, cosmetic and toilet articles retail trade in specialized stores (compared to previous month) in the European Union from September 2016 to August 2018. In August 2018, the volume of pharmaceutical and medical goods retail sales in the EU-28 increased by 1.1 percent compared to the previous month. * Eurostat estimate (phased out). Pharmaceutical and medical goods. Refers to European Union - 28 countries. The volume of retail trade is an index measure of the evolution of turnover (or total amount of goods sold) in the retail trade. Data is working day and seasonally adjusted.